Gajar ka halwa or Gajrela was made several times at home and I think this was one of the most frequent dessert during winters. Though my mother was very fond of khuskhus ka halwa and mewe ka halwa so those were also made but gajrela was always made in large batches and we used to eat it at room temperature mostly. Probably because that was not the age of microwave ovens to reheat food within seconds. 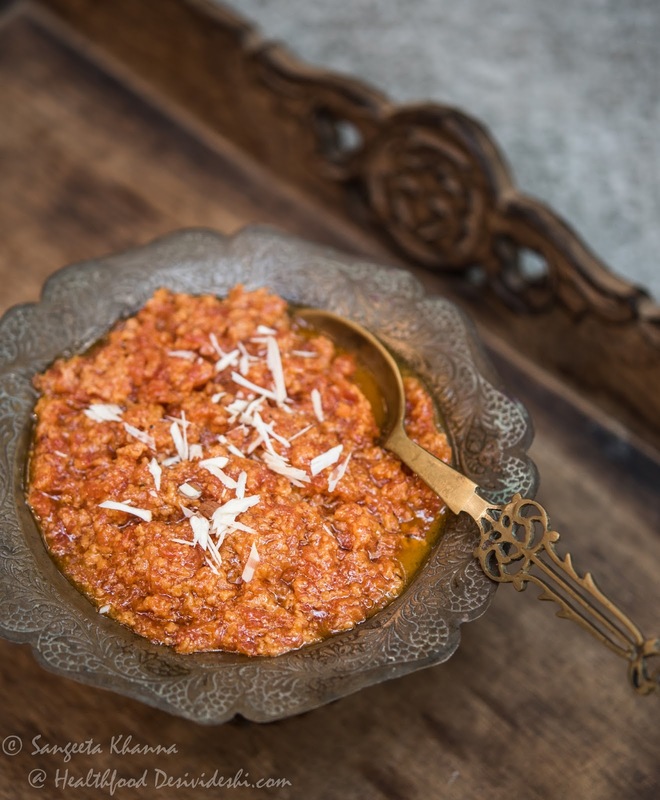 Hot gajar ka halwa was served in parties or at sweet shops. There are so many sweets available in Banaras that one gets disillusioned after entering a sweet shop. Honestly speaking I had never seen so many varieties of sweets when we were in Chandigarh, the only time we used to see and eat sweets used to be the family weddings. In the earlier days sweets were made in huge quantities during weddings and since the celebrations and rituals used to last 4-5 days there was a constant making of sweets in one portion of our grandparents' house. Everyday there would be a new set of sweets for guests, it was an integral part of khatirdari (welcome). During these family weddings pani pilana or offering water to someone always accompanied a plate of 4-5 different sweets served on a terracotta platter or a leaf dona. Such was the tradition of sweets or mithai that you never offered water to someone without some mithai. I remember sitting by the halwais as a little girl and watching how they made those sweets. Even in those days I couldn't eat mithais but watching them make trays and trays full of mithais used to entertain me or may be I used to entertain those mithai makers too. Every season has it's own special sweet, winters bring the gond and dry fruit laddus, kaju katli, badam katli, patisa etc, while the summer sweets are lighter chhena sweets like cold rasmalai, rasgulla and sandesh etc. Of course there were loads of all season mithais too. 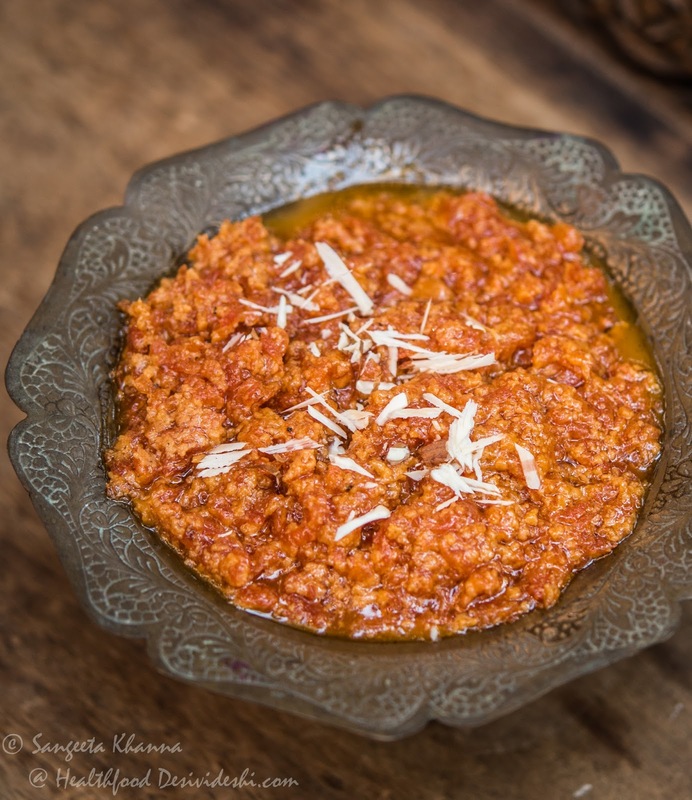 In winters gajar ka halwa is a common sight on the display of sweet shops in Banaras, and in many other old cities, usually laden with dry fruits, khoya and a layer of ghee making it look glazed. Gajar ka halwa is mostly served hot so some of the chaat bhandars of Banaras do a brisk sale of gajar ka halwa during winters. I make it lighter at home, with a little little lesser khoya so that the taste and color of red carrots is more prominent. I don't want to drown the flavour of carrots in khoya. In a large thick bottomed pan boil the milk and keep stirring till it reduces to half, add the grated carrots and keep cooking on low flame, stirring in between till it becomes dry and collects in the middle of pan. Add sugar, green cardamom powder can be added too, I don't add it because I like carrot's own flavor more. It will become a bit watery after adding sugar but keep cooking till carrot shreds appear shining and glazed. It is cooked now. Add a tbsp ghee and bhuno for a few minutes to make the halwa sondha. If using khoya, add the khoya along with sugar and bhuno till the halwa looks glazed and danedaar (granular) khoya looks interspersed with carrot shreds. Garnish with chopped nuts and serve hot or at room temperature. It can be stored in the fridge for a fortnight.